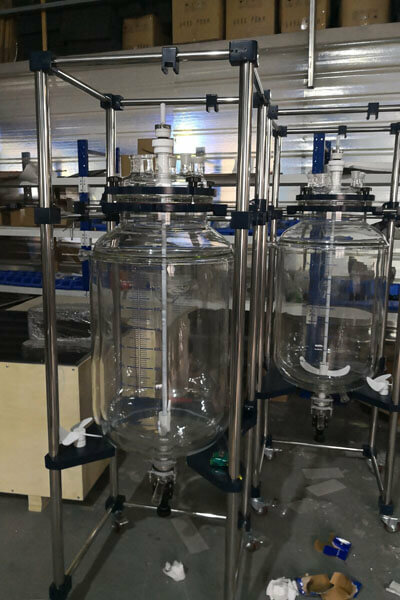 Professional glass reactor is a common biochemical laboratory instrument which is widely used in modern fine chemical ,biopharmacy,scientific research experiment.professional glass reactor can be used for concentration,reflux,seperation,purification,distillation and other experiments which is an ideal instrument for teaching,manufacture and experiment. 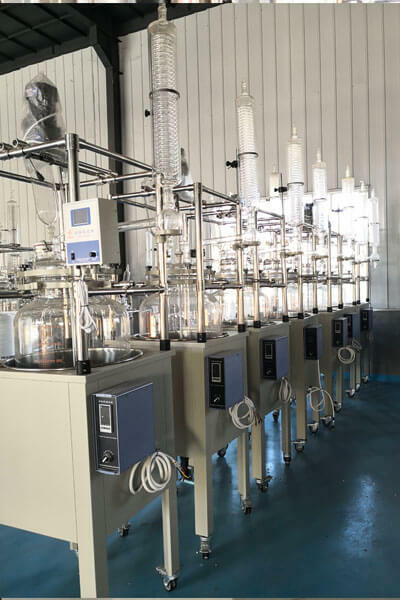 In order to enable you to use the professional glass reactor safely,the precautions of using the glass parts of the professional glass reactor are listed one by one for you. 1.when using vacuum grease on rotating parts such as glass rock and feeding pipe,please choose a smooth and sticky vacuum grease. 2.paint the smooth vacuum grease on the valve element evenly to make the grinding mouth fully fit. 3.after long period of use,the fraction part painted with vacuum grease will oxidize or harden which will lead to the difficulty of rotating or sticking to the fraction part.so before the grease get hard please demount the parts and wipe off the grease on it with a tissue and then use toluene and xylene and other solvents to wipe it off carefully.After the solvent completely evaporates, re-paint the new vacuum grease. 4.if the grinding mouth has been tighten or adhesion,remove the glass forcibly will cause broken.In case of adhesion at the grinding mouth, please use the heating method(hot water,blowtorch)to soften the solidified vacuum grease before removing it.if the adhesion condition is very serious,it’s very dangerous to disassemble by force.please contract Lanphan after-sale service department. 5.the glass parts are fragile,so please check the glass parts carefully before assembly.if the glass parts of the professional glass reactor broken caused by transportation problem. our company will replace a new one for free of charge .we are not responsible for any damage or crack of the glass during use. 6The best way to remove glass parts that are difficult to remove is to use the appropriate detergent to dissolve the attachment before cleaning. For glass parts with fine and complex structure,if the brush can’t be cleaned washing fluid can also be used for leaching.When inverting the glass vessel wall to form a layer of uniform water film and no dripping beads do not flow down the strand, it means that the glass vessel of the professional glass reaction kettle has been cleaned. 7.Generally speaking,the best time to clean the glassware is right after the experiment,but there are some exceptions.For example, after some solution poured out,the inner wall of the glass seems to have no attachment,but after a period of time will produce attachment and not easy to clean.there are even some chemicals that can react with the glass itself and can damage the glassware if left unwashed.so the laboratory technician can just the cleaning time according to the characteristics of the chemical substances reacted in the professional glass reactor. This above is the matters needed to be paid attention to when using and cleaning the glass parts of the professional glass reactor .the structure of the professional glass reactor is complex ,so you should be carefully accordance with the instructions when use it.if you encounter some problems in operation,please follow the instructions to troubleshoot them.if not,please contract our professional technical staff in time to solve them for you.Henan lanfan technology co., LTD. Spring Festival holiday from February 4 solstice February 11, during this period of inquiry please call 13783661974.